My family moved to Kent when I was 6 years old. Apart from a period in London after university, I have lived here for the vast majority of my life. It's a great place to live. Close to the coast, close to the capital, not much more than a hop to the contient; I feel very lucky! Since having the kids, I have discovered so many places that I had never visited when I was growing up. It's been a great voyage of discovery (both the parenting and the locations! ), and pleasingly, the discovery continues. This summer, I bravely ventured away from the familiar favourites, and was really pleased with what I found. We visited mid-week to find easy, free parking in the car park found at the end of Church Lane (enter postcode ME14 4EE for directions on your satnav. You can also park for free on the A20 Ashford Road - enter postcode ME14 4NB and look out for the entrace just West of the Esso and BP garages). A short walk down Church Landway past allotments and tennis courts brings you to the entrance to the park itself. You'll see the small - but perfectly formed - children's playground which amused a 3 and 6 year old for a good 30 minutes, a grass maze and plenty of further walking through open pastures and along treelined paths. We did a circuit and came back to the car park past the pretty 15th Century Holy Cross Church. 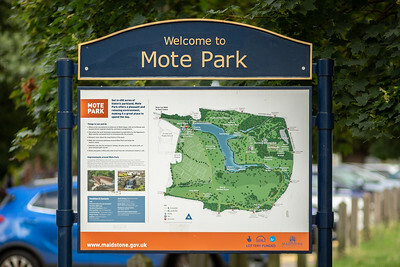 If you live near Maidstone, you'll have heard of Mote Park. 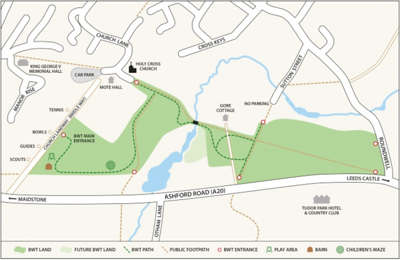 Over 450 acres of green space, lakes, woodland and rivers, there's something for everyone here. We parked in the main car park (post code for satnav ME15 7SX) accessed from Mote Avenue and it cost just £2 for 6 hours. The playground is BIG! And offers various areas for different ages. You can see pretty much the whole playground from any of the benches around the side, so if you've got kids of varying ages playing in different areas, you can still see them safely. There is also a skateboard and BMX park adjascent to the playground. Once the kids tired of the playground, we wandered into the grassland for a picnic lunch. Nearby is The Mote Park Pavillion cafe if you need a cuppa or a sandwich, and a toilet block which, at the time of writing, could do with a severe clean! We didn't really explore much more than that on this visit, but there is a large picteresque lake where you can sign up for some fun water sports and activities. We will definitely be back to try some of those when the kids are a bit bigger. This was one I hadn't heard of at all, and I'm really delighted that I now know about it; I'm definitely going back again. The picturesque bridge from which the park gets its' name, dates back to the 14th Century. There is a small car park, a mobile catering van provides teas and coffees and the toilet block was clean. At time of writing, parking is charged at £1.30 on weekdays and £2 on weekends and bank holidays. There is a large grassy area (where an annual kite festival is held in August), which is perfect for ball games, picnics and general running about. The playground is lovely, and furnished with wooden apparatus and a woodchip floor covering. 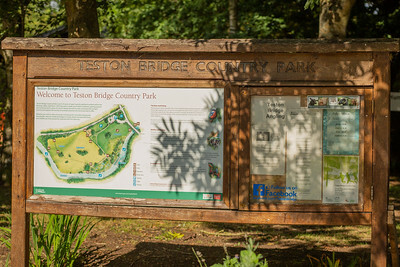 Surrounded by trees, yet with a view down to the River Medway and Teston Bridge, it was a very nice place to while away an hour whilst the children climbed and slid and swung. When they had tired of the playground, we went on a wander down the the river where there are the ruins of an old water mill, a working lock and beautiful scenery. And then, because the sun was shining and the kids had been 'moderately' good all day and also let me take pictures of them (! ), we all headed back to the cafe van in the car park to enjoy a lovely icecream before heading sleepily home.